Saint Mary Ethiopian Orthodox Tewahido Church of Atlanta provides the following Services to all Christians in Greater Atlanta area. (In according to E.C.). The service on this day include prayers, the Divine Liturgy and Sermon by the Clergy. 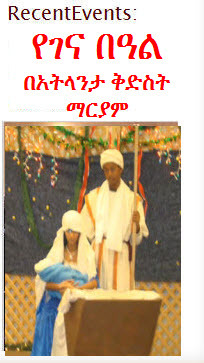 For more information on Ethiopian Orthodox Church Divine Liturgy, please follow the following link. Of the seven sacraments, Baptism is the first. 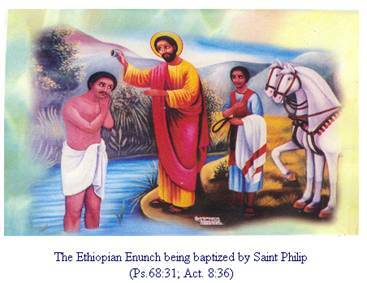 Baptism is the sacrament through which we are reborn and enter the Kingdom of God. (Jn. 3:5). Baptism has a Biblical basis (Mt. 28:19-20). • Both should belong to the Orthodox Tewahido Church. If any one of them is not a member, he/she should first be a member of the Church. • No pre-martial sexual relationship is permitted. • Both should consent to be united in marriage. • No marriage is allowed within seven generations so as not to break the rule of kinship that forbids marriage between close family relations. (Lev. 18:6-21; Deut. 7:3-4). • In our Church one to one marriage only is allowed. • Bishops and priests celebrate the Sacrament of Matrimony. • Parents should be consulted and their consent should be secured. Copyright 2010. 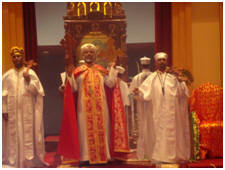 St. Mary Ethiopian Orthodox Tewahedo Cathedral. All Rights Reserved.